Movies that are based on books are awesome. Movies starring Tom Hardy are really awesome. Movies that are based on books and also star Tom Hardy are off the charts awesome. On this perfect fall Friday, I can think of no better way to start off the weekend than with a look at five times Tom Hardy took on a movie adaptation and owned it. Okay. Maybe there are a few better ways to start off the weekend—like with Tom Hardy making me pumpkin muffins while reading The Thorn Birds out loud to me—but since that’s not happening, let’s stick to the list. I know that there are fanatics who think that any changes made from the page to the screen are not only unacceptable, but offensive. There have been times when I’ve felt that way myself, but for the most part, if the movie really captures the essence of the book and the casting is right, I’m on board. This BBC adaptation does at times stray from the Dickens classic, but it’s also my favorite Oliver Twist movie to date. 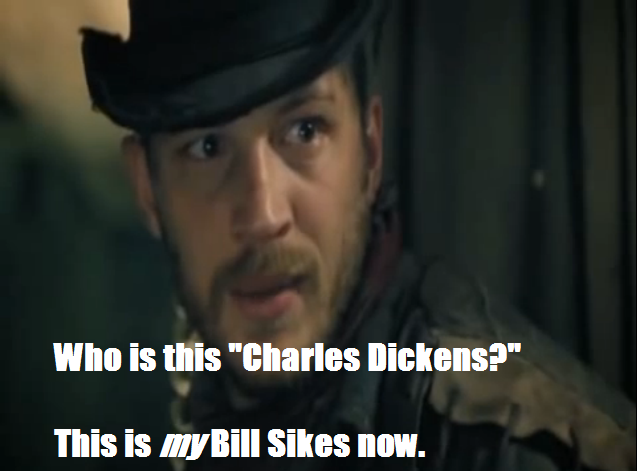 The cast—from William Miller’s Oliver to Timothy Spall’s Fagin—is utter perfection, and no one is more perfect than Tom Hardy as the murderous Bill Sikes. He doesn’t just tackle this famous role—he makes you forget any other Bill you’ve ever seen. When dealing with Dickens, it can be easy for some actors to slip into caricature mode, but Hardy’s Bill is a fully-formed human being…scary as he may be. Wuthering Heights is one of my all-time favorite books and Heathcliff is one of my all-time favorite literary characters. Because of this, countless adaptations have disappointed me. It seemed that no one really understood Heathcliff as I knew him; he was always portrayed as either an insane villain or a lovesick sap. Then Tom Hardy came along. Tom Hardy is Emily Bronte’s Heathcliff. There is never any doubt of how much he loves Cathy and there is also never any doubt of the vengeance he is capable of wreaking. 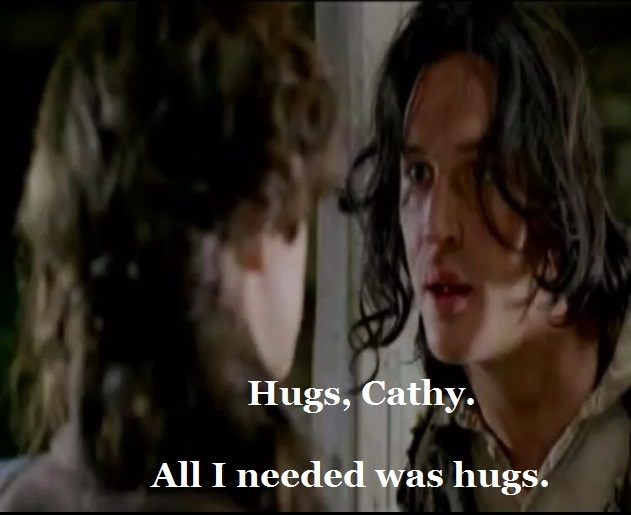 His portrayal shows us that if only someone had given poor Heathcliff a few more hugs when he was younger, things may have turned out differently. But no one did…so watch out. 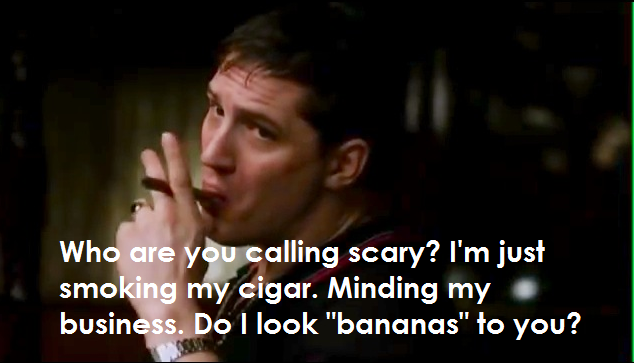 No one can do bananas quite like Tom Hardy. If you need to be chilled to the bone, watch his turn in Martina Cole’s The Take. In this four-part miniseries, Tom plays Freddie, a man working his way up the crime-boss ladder after his release from prison. His performance is downright terrifying, and one that can’t be missed. Set aside an entire Saturday to watch this, and make sure you have a throw pillow on hand in case you need to cover your eyes. In this movie, Tom Hardy proves what a brilliant actor can do with a few grunts, mumbles and monosyllabic sentences. Based on Matt Bondurant’s The Wettest County in the World, the movie follows the story of three brothers bootlegging moonshine during Prohibition. As the band’s leader, Forrest, Tom manages to be sympathetic, stoic, dangerous and endearing—with a few sprinkles of humor mixed in. Also, this one is worth a watch just to see how cute he looks in his cardigans. The Drop may be touted as James Gandolfini’s final film, but this movie belongs entirely to Tom Hardy. In it he plays Bob, a quiet guy working in a Brooklyn bar controlled by crime rings and money laundering. There is so much to love about his performance—from the way he accidentally rescues a dog to the way he awkwardly woos a woman in the neighborhood. Like any Dennis Lehane story, The Drop is intricately plotted, gripping and more than a little surprising. The drama is great, but Hardy’s Bob makes the movie what it is. Plus, we get to see him carrying a puppy around for 90 percent of the film, so you really don’t want to miss it. Thank you, Tom Hardy, for never letting us booklovers down. If there was only a way you could be in every movie ever made, life would be so much better. And if you could wear a cardigan while doing it, that would be great. I’ll also put in a vote for Dark Knight Rises.I know he got a lot of flack for his portrayal not matching people’s expectations of Bane, but I thought he was great. And without spoilers, when the end reveal shows why he has committed himself to a life of crime, Tom Hardy does some amazing acting all within his soulful eyes.